(The Pavement, 23 May 2009) There is a new motto for London-based Veterans Aid and Edinburgh- based Scottish Veterans’ Residences (SVR), which together have formed a unique alliance: two heads are better than one. Both charities offer assistance to ex-service men and women who are homeless, at risk of becoming homeless or in need. Yet while SVR concentrates on providing independent living accommodation, Veterans Aid offers more immediate relief to street homeless. “We’re the A&E unit for the veteran community,” Veterans Aid chief executive, Dr Milroy, concludes. The new partnership will involve sharing expertise and resources and breaking down “territorial boundaries” to provide a more efficient, linked-up service. “What we both agree on is that we don’t need to build new warehouses for human beings,” says Dr Milroy. “What we do need to do is use what we’re doing better.” SVR chief executive Lt Col Ian Ballantyne adds: “Forming [such] alliances‚Ä¶ can only increase the accessibility to and provision of help that our ex-service men and women need and so richly deserve”. The veteran community in the UK is said to number around 10 million, so it is perhaps inevitable that a percentage will face homelessness at some point in their lives. However, there are many charities and organisations dedicated to helping those who have served their country. Dr Milroy is optimistic about the volume of care dedicated to this section of society. “If you’re homeless and a veteran, you’re in a much stronger position than you’d be in if you weren’t,” he says. While only just formalised, the alliance between the two groups has long proved beneficial. One veteran helped along the way is Jock, 43, who served in the Black Watch for four-and-a-half years. Following a car accident, Jock suffered a nervous breakdown, his previously successful business failed and his relationship ended. He was then evicted and forced to sleep rough in London for six months. Finally, severely depressed and suicidal, he contacted the charity Borderline, which helps homeless Scots in London, who put him on to Veterans Aid. As he was keen to leave London, Jock accepted Veterans Aid’s offer of a place at SVR’s Whitefoord House in Edinburgh and within 10 days had moved in. Nine months on, Jock was back on his feet, a change he attributes to Whitefoord’s staff and residents. “They helped me to get back my self-esteem just by being able to talk to people who understood,” he says. “Arriving at SVR was like going back to a family”. The importance Veterans Aid puts on dignity and self-esteem is another key part of their service – whether it is the way all veterans are referred to as ‘Mr’ and ‘Mrs’ or by their service rank, the high-quality hostel or the brand-new clothes that are handed out – including, at the moment, some snazzylooking jackets from Renault’s Formula One Racing Team. As well as accommodation, the charity provides food vouchers, travel warrants, money, and access to training, employment and housing. Veterans stay at the hostel for an average of eight to 10 months, and when they do move on, they are helped to settle in to their new home with furniture and other essentials. As well as clothing donations, Veterans Aid receives calls from people offering the veterans work. The charity provides employment too, for example, hiring Bob Gordon, a former Royal Ordnance Corps physical training officer and ex-New Belvedere resident, to join the Veterans Aid team. Having come through homelessness, alcoholism and more, today Mr Gordon can be found bustling about the Veterans Aid office, booking hostels spaces, updating the database and joking with his colleagues about having an Equity card for all his media appearances. He is even set to receive a new look after a makeover programme got in touch with Dr Milroy offering to work their magic on three lucky veterans. The charity is funded by donations and grants from a huge variety of social care and military groups, from Seafarers UK and the RAF Benevolent Fund (RAFBF) to Supporting People and Royal Hospital Chelsea. In terms of local government, Dr Milroy has nothing but praise for the London Borough of Tower Hamlets and the help they provide. Despite being a tiny charity, Veterans Aid has what Dr Milroy calls a “powerhouse” of expertise, including a barrister, military psychiatrist, social and outreach workers and a professional alcohol counsellor. Dr Milroy himself is a military welfare specialist, as well as a former wing commander and the current chair of the Ex-Service Action Group. Combined with excellent contacts and ability to, for example, purchase a place at a detox centre instantly, this makes for a very smooth service. When The Pavement visited the headquarters in Victoria, a veteran turned up at the door and was instantly whisked into a room, identified as having been there before from Veterans’ Aid’s private database, and a room was organised for him at New Belvedere House – all within the space of about five minutes. In the past, two veterans were so astonished to be offered a detox place instantly, they ran out on Philip Rogers, Veterans Aid’s specialist on support and counselling. Scottish Veterans’ Residences has been going even longer than Veterans Aid and is Scotland’s oldest ex-service charity. Founded in 1910, SVR provides residential accommodation to ex-servicemen and women and their spouses. Over the years it has helped some 60,000 veterans, from both world wars through to more recent conflicts in Korea, the Falklands and the Gulf. Like at Veterans Aid’s hostel, all veterans staying in SVR accommodation at Whitefoord House or Rosendael in Dundee have their own room. In addition to 81 en-suite rooms, Whitefoord House has 11 self-contained flats available for rent, while Rosendael has accommodation for 45 veterans. Owned and managed by Scottish Veterans’ Housing Association, the two full-board residences provide veterans with security, privacy and areas to socialise such as bowling greens, gardens and sitting rooms. The sense of community is reinforced with regular commemorative, social and fundraising events, while a team of managers, many of whom are ex-service men and women, provides assistance. The work of SVR is funded in the main by the basic, individually assessed accommodation charge paid by residents. This is supported by statutory funding support, such as housing benefit, income support and supporting people allowance. Dr Milroy is equally indignant about people who say it is the fault of the forces that some veterans end up homeless. 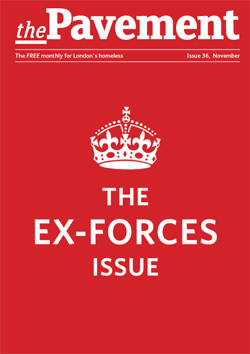 “These people are homeless for the same reasons as everyone else: poverty, housing, alcohol or substance misuse, relationship breakdown… It’s absolutely vital to understand that it’s not about military service, it’s not about institutionalisation – if it was, it would all be happening the day after.” SVR, however, is less opposed to the idea of institutionalisation, its website saying “many exmilitary personnel find adapting to civilian life extremely difficult.” While Veterans Aid does receive calls from serving soldiers, most of those who get in touch are veterans from conflicts some 10-12 years before, with some coming through Veterans Aid’s sister organisation Combat Stress. SVR covers much the same range, helping those who have recently left the armed forces as well as veterans who have been isolated or homeless for many years. With such a caring support network, it is no wonder some people try and pass themselves off as veterans to Veterans Aid and other military charities. Dr Milroy has even been introduced to someone pretending to be someone he knows, but he takes it lightly. “We direct them onto other projects, we don’t abandon them‚Ä¶ It doesn’t matter”.